No matter what kind of industrial precise device manufacturing work fields, there is always high level of accuracy line alignment required for current industrial precise device processing. It is not an easy job for users to get super accurate line alignment within quite short time consumption, however, until the time users are getting chance to make use of an excellent quality separate crystal lens blue laser line generator, it is just keeping highly uniform blue laser beam and blue reference line targeting, and then achieving high level of accuracy cross line generation on all targeting surfaces effectively. This blue laser line generator gets the use of import 445nm blue laser diode as its laser beam emitting source. It is getting much shorter wavelength than 473nm blue DPSS laser system, however, this high power 445nm blue laser module is just keeping differ laser beam in type of direct diode emission, and just available with quite compact structure design. This high power line laser alignment tool is just able to be made with small size laser tube diameter of only 16mm, and then also available with quite low production cost. 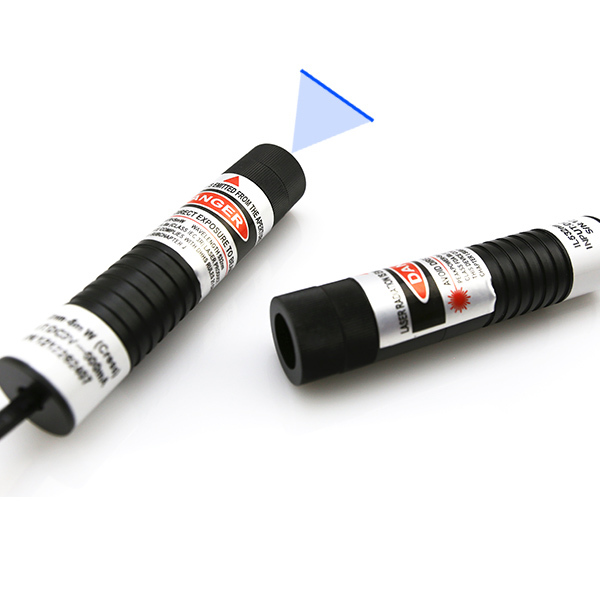 At the same time, owing to quite special design with electric wires, this line laser alignment is always allowing quite easy and convenient installation within 0.3 meter to 3 meters, and then making sure of quite convenient and no barrier blue alignment laser line targeting on different working surfaces. In current industrial precise line alignment work, this high power blue laser line generator gets easy use of qualified separate crystal lens. It is getting much better performance than any other plastic coated lens or glass coated lens. High intensity blue laser beam is just converting into up to 80% high uniformity blue reference line in distance. When blue laser line targeting is processed at even longer distance, it is still keeping the same line thickness from middle part towards both ends, and then assuring the highest level of accuracy blue line generation in use. Within the selectable optic lens degree of 10 degree to 93 degree, this separate crystal lens blue laser line generator gets selectable line length of 0.5 meter to 6 meters, and then making sure of high level of accuracy blue line alignment in quite long distance working occasions. According to its quite compact structure design, even though some of working place is not easy to reach, noncontact blue alignment laser line is still taking the lowest time consumption, and then getting high level of accuracy line instruction effectively. Under condition that it is emitting quite powerful laser light and thermal energy, users should just remember to wear proper laser safety goggles until getting no mistake line targeting perfectly.